We set off at 7:00 for our first full day of walking. 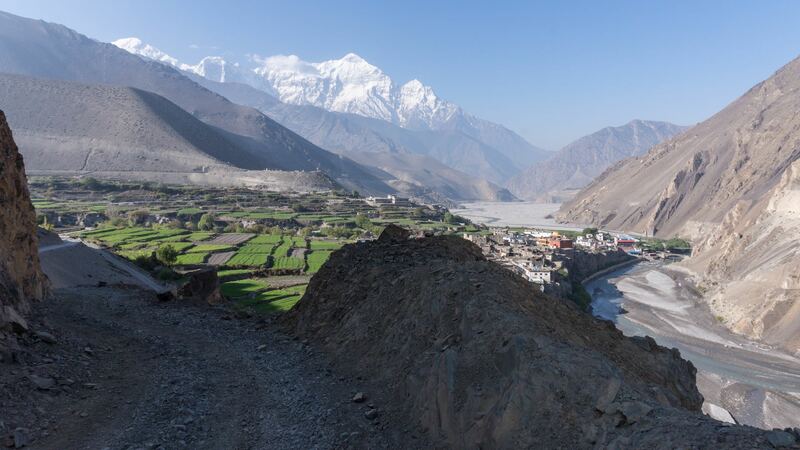 After a steep climb up to the road on the east side of the river, we walk for a bit and then turn around for a last view of the Kali Gandaki as it flows southward. Nilgiri North (7061) and Tilicho Peak (7134) along with Nilgiri Central (6940) are to the east and make for a stunning early morning view. 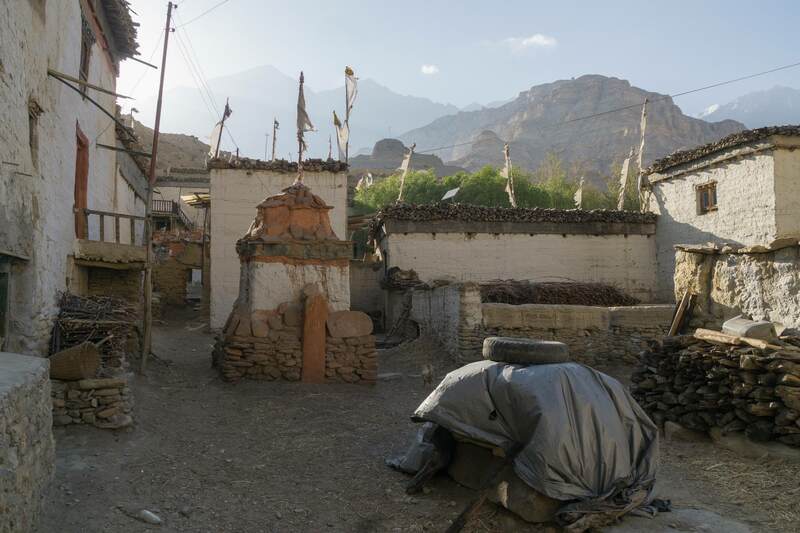 Still clearly identifiable is the gompa with its gold-coloured top. The green fields that surround the village make clear on what its prosperity is based. 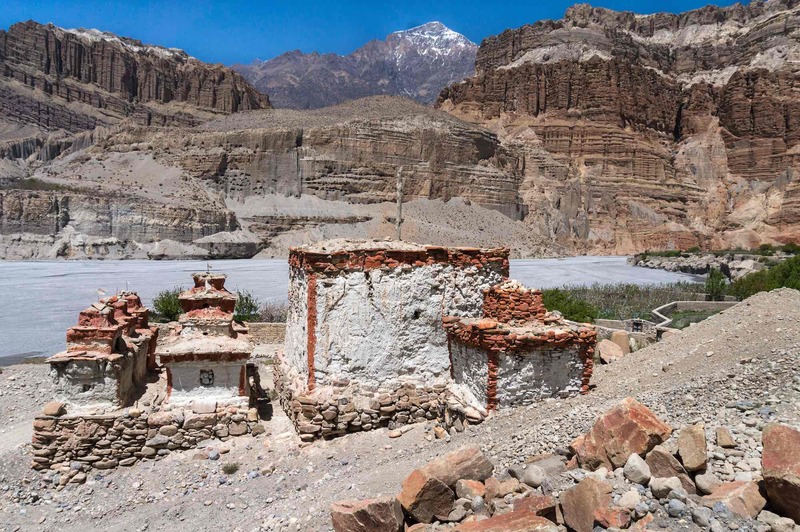 As we walk up the road – and occasionally a side trail that avoids the road – we look across the river to Tiri, the last village (gaon) trekkers can walk to without that $500. permit. If nothing else, it would give visitors with another view of Kagbeni. 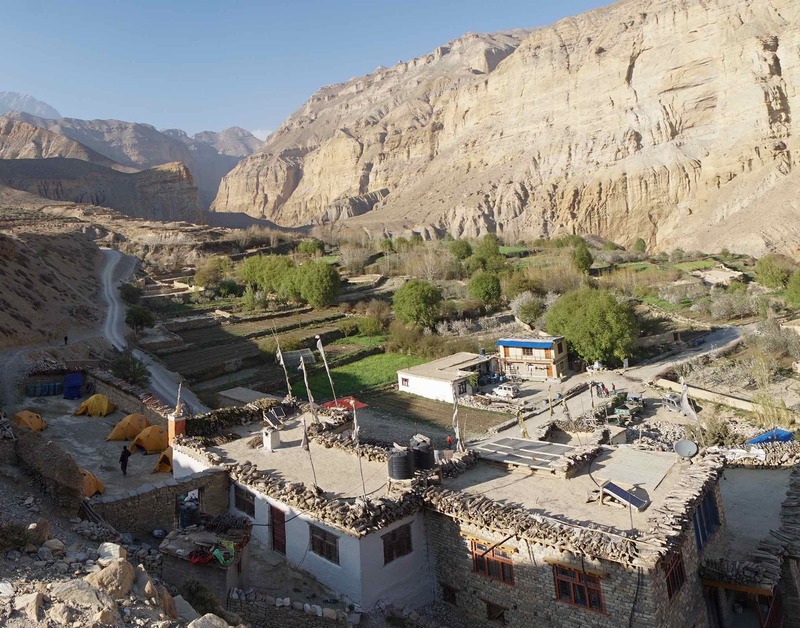 By vehicle, it is possible to cover the 88 kilometers from Jomsom to Lo Manthang in a day. 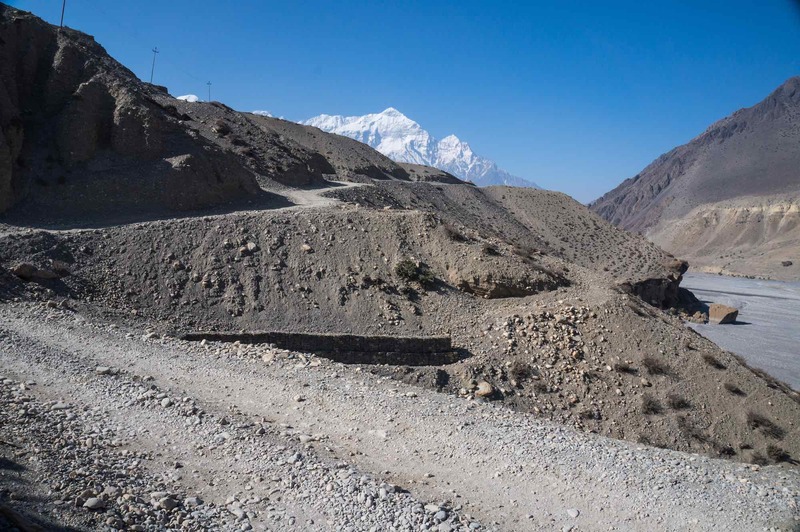 Given the amount of road work that we would see during the four days spent on the walk to Charang, the district is undergoing a dramatic change which will greatly change its character. 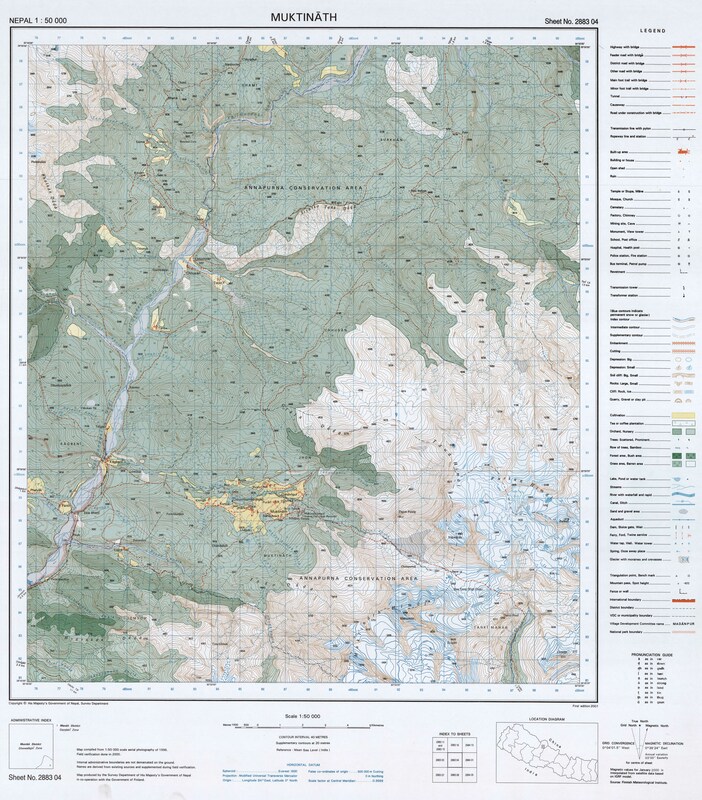 Not far away is Kora La, the lowest of the four border passes indicated on the map below. The Chinese road to the 4660-meter-high pass is already complete. 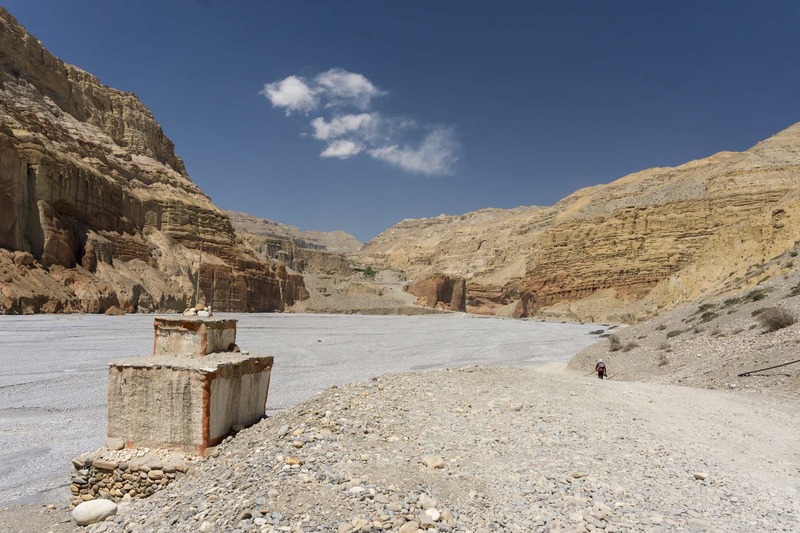 A major truck container port facility is planned for the Nepalese side of the pass. 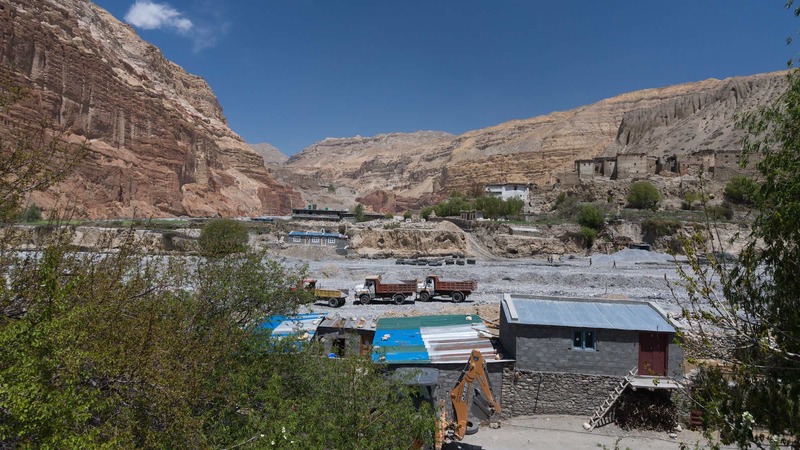 Within the next decade, the Mustang road from Kora La to Jomsom and on down to Beni will become one of four major supply routes from Tibet. 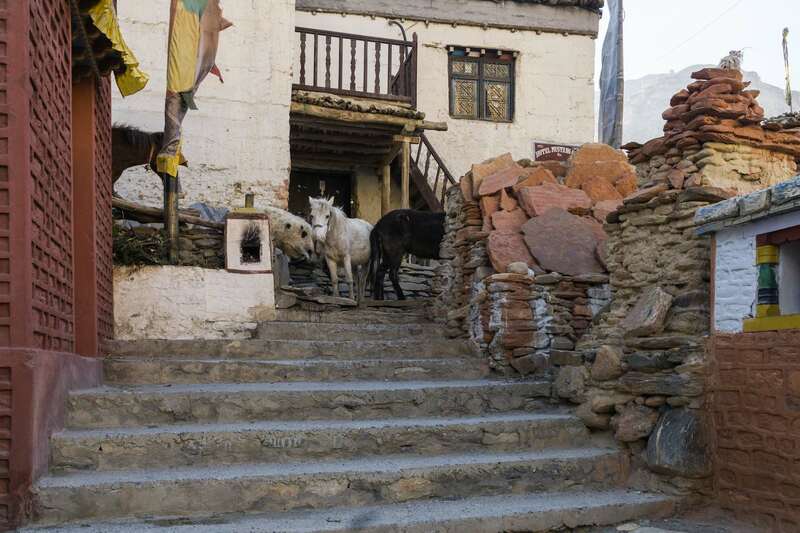 By then all the travel brochure talk about it being “the last of the forbidden kingdoms” with its exotic Tibetan Buddhist culture will finally be put to rest. 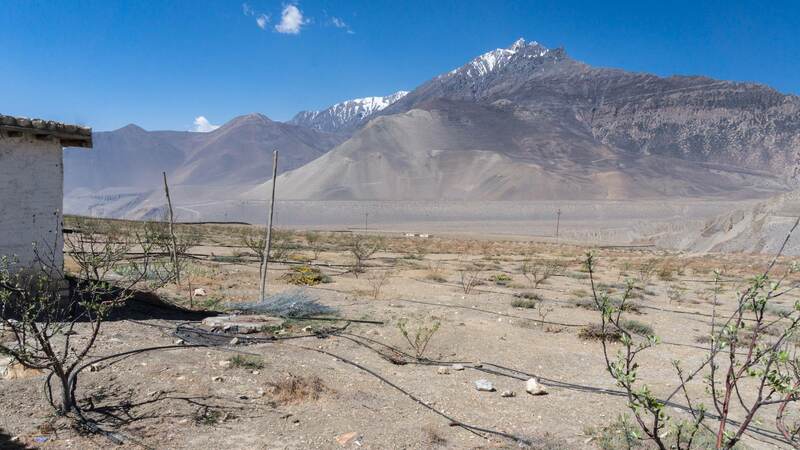 Instead of the backwater it became when the Chinese sealed the border in the early 1960’s, it will perhaps be what it once was in its heyday four hundred years ago – an important trans-Himalayan trade route. It was control of that trade route which paid for the palaces and gompas of the once Kingdom of Lo. 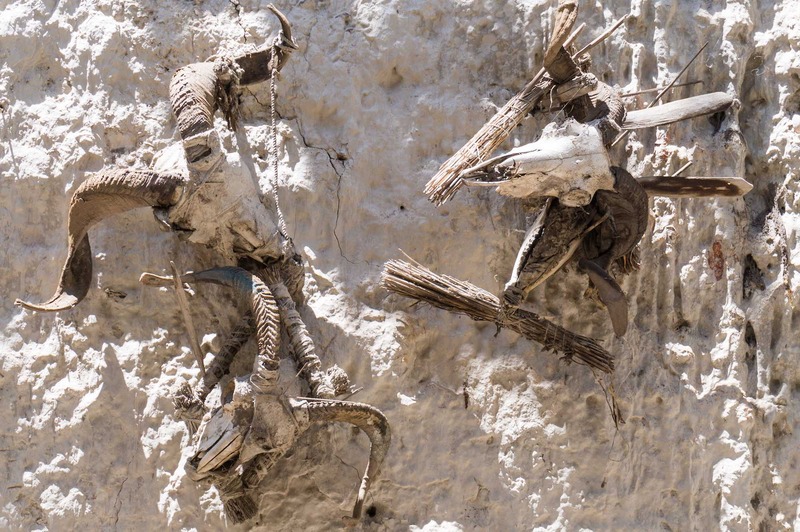 I am sure the locals – the 6000 – 7000 that are left – are hoping that the road will also bring economic opportunity for them as the district is flooded with Chinese goods. 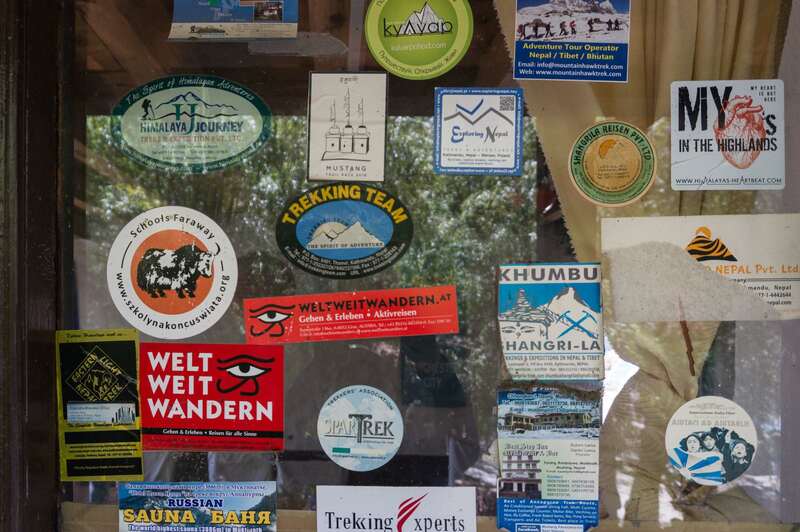 What it won’t be bringing is more trekkers. 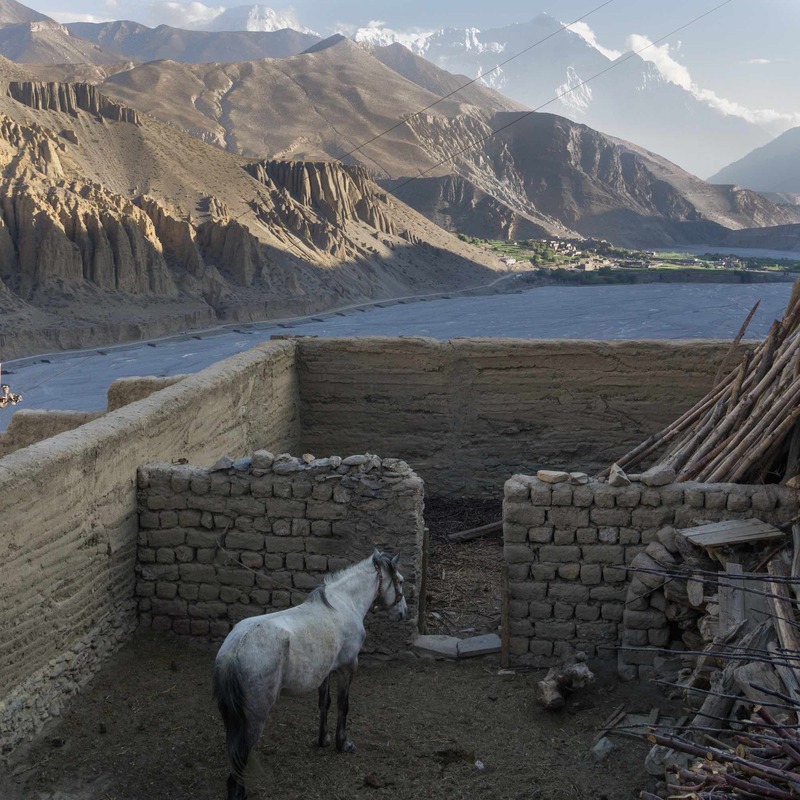 Like the Annapurna Circuit, the road development in upper Mustang will destroy much of what attracts 2000 to 3000 annual visitors. One thing the completed and upgraded road won’t do is take away from the stunning views. 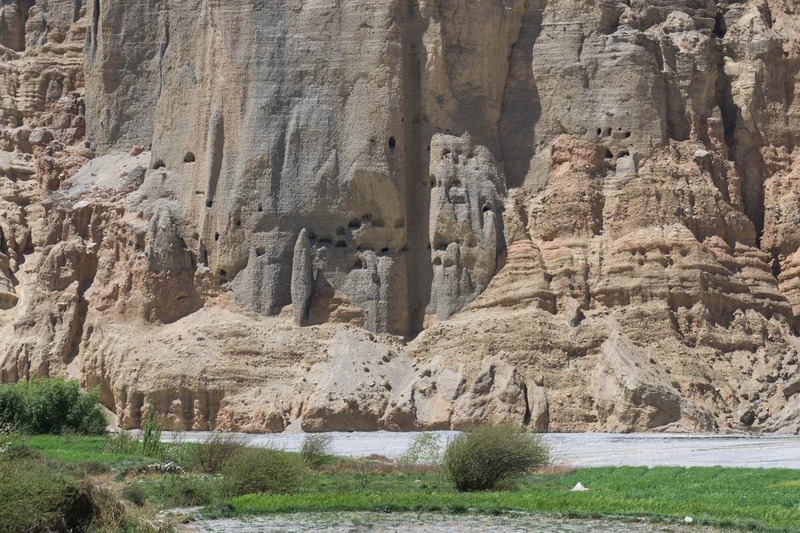 Multi-coloured rock faces and breathtaking karst formations and stretches of vertical sandstone rock face pockmarked with “sky caves” carved out by earlier inhabitants of the valley as burial chambers or perhaps even as living quarters. 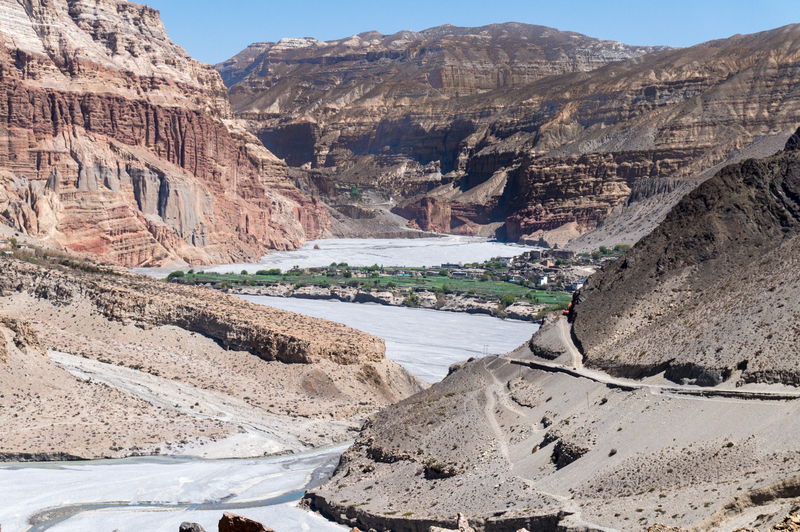 For anyone with an interest in geology, a trip up the Kali Gandaki from Kagbeni will never get old! The vehicle traffic was thankfully light as we walked up the road. Given how dry everything was, those made-in-India Mahindra Bolero SUVs can stir up quite the dust storm as they pass by. The Tangbe Apple Farm looked far from being a reality, its derelict front a reflection of the few young trees struggling to root themselves in the sand. Tangbe itself is to the north of the apple “orchard”. We did not enter the village but rather followed the road as it skirts the settlement. Busy at work in the vicinity was a road construction crew of about twenty with some substantial earth-moving machinery at its disposal. 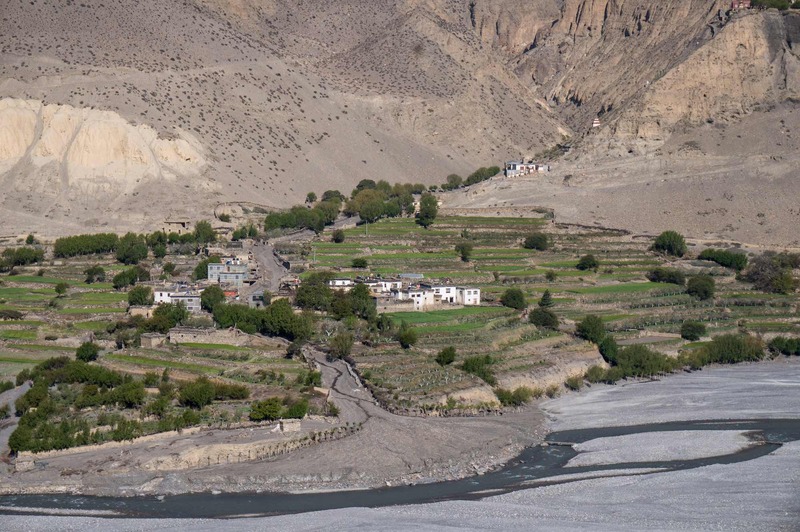 North of Tangbe another stretch of green fields bordering the Kali Gandaki – apple orchards and fields of barley and buckwheat. 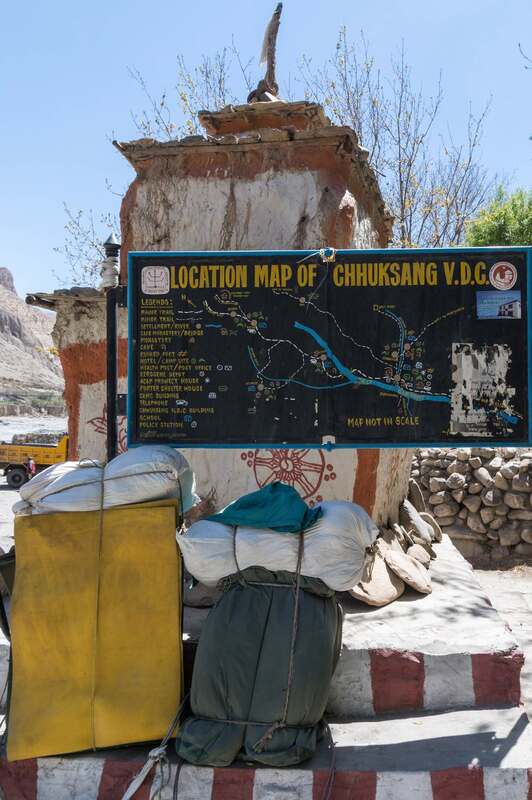 A bit to the north of Tangbe was our lunchtime destination – Chhuksang. It is the thin sliver of green you see dead center in the image below. You can also see the road we walked along to get there. 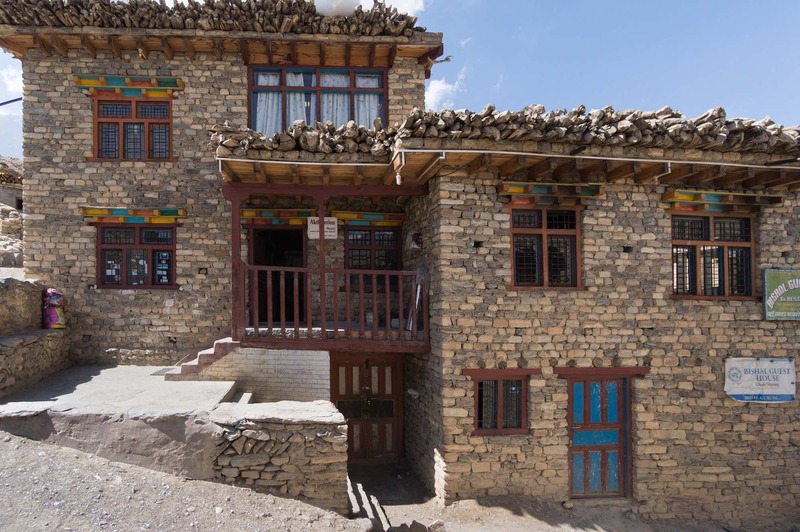 The Bhrikuti Guest House was our lunch stop on this day. We had the use of their dining hall; our cook crew prepared the lunch down below using some of the guesthouse’s facilities. 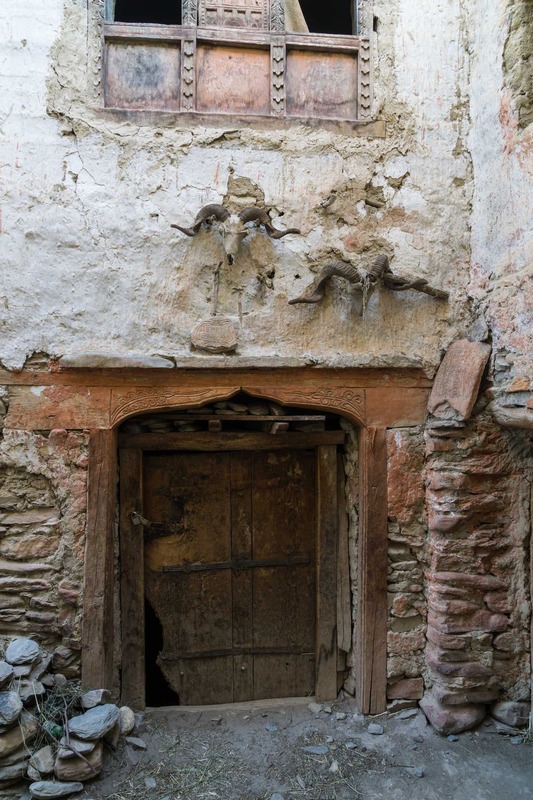 While we waited, I set off on a walk up and down some of the village’s alleyways. 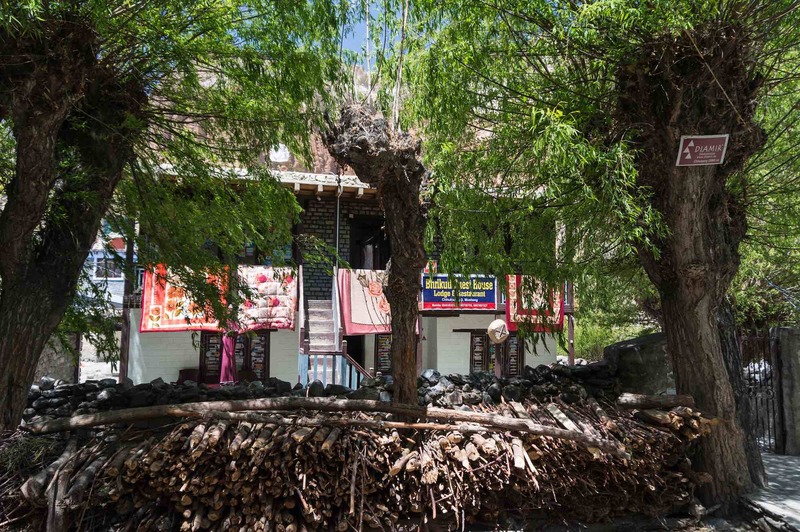 Chhuksang is said to be one of the five villages in the area – the others are Chele, Ghyakar, Tangbe and Tetang – where the Gurung culture is dominant. 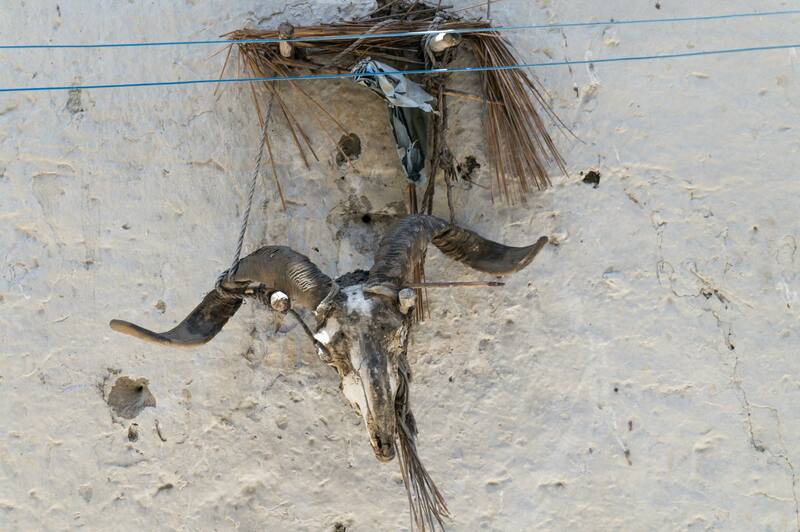 On the other hand, the ram’s horns and skull are talismans common in Tibetan folk culture; they are often placed above doorways to ward off evil spirits. 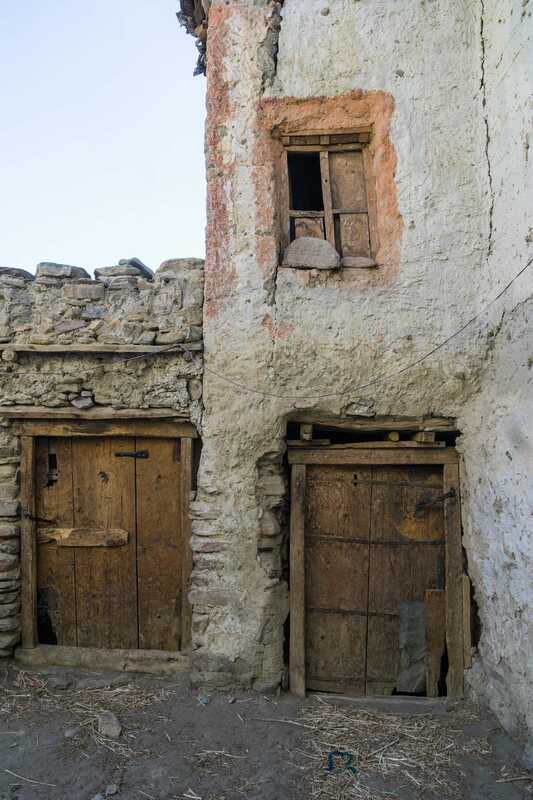 I was surprised to find a few examples as I walked around this supposedly Gurung settlement. It may just be one of those customs shared by a number of cultural groups. 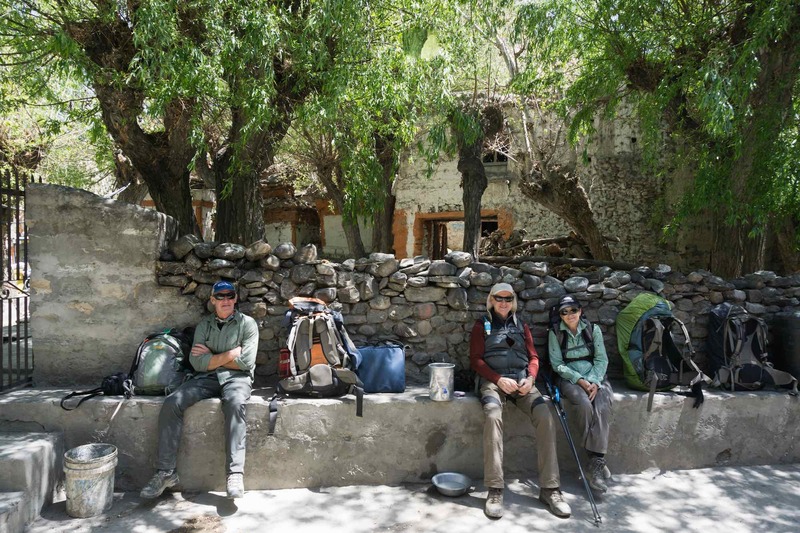 Our lunch done, we would walk across the dry Narsin Khola riverbed and continue on our way to Chele. 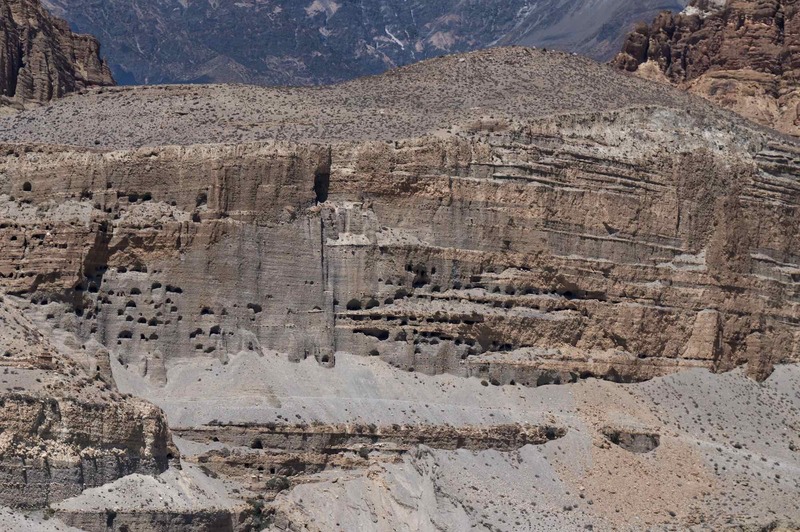 The photo above was taken from the north side of the Narsin and captures most of Chhuksang. 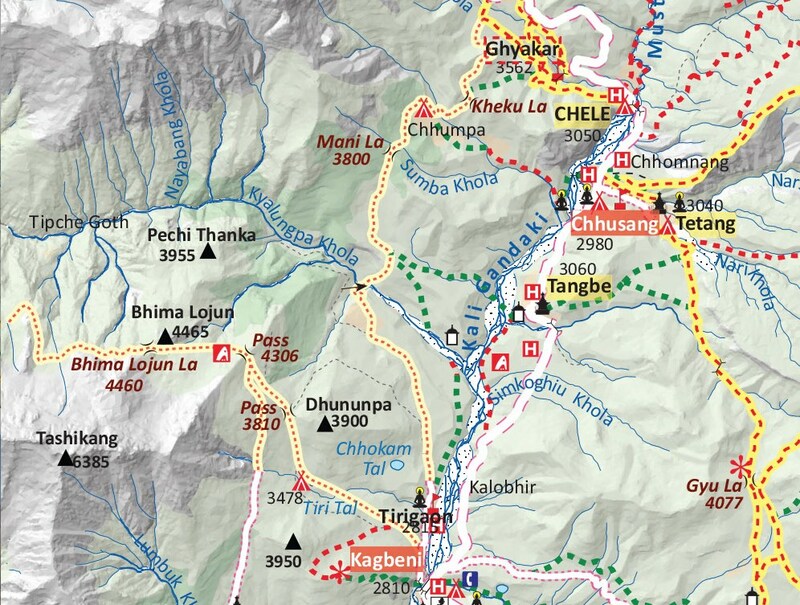 The map below shows the fairly flat route up towards Chele and the bridge across the river. Along the way yet more examples of “sky caves”, both on the west side of the river and in the cliff face on the east side above the bridge that took us over to the beginning of a steep climb up to Chele on the plateau. Halfway over the bridge, we looked into the tunnel that the river had carved out of the sandstone. 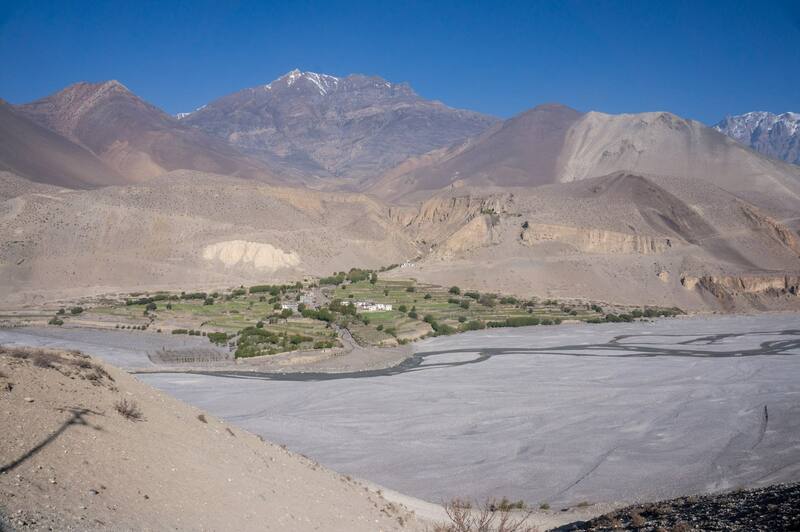 North of this point the Kali Gandaki loses it wide floodplains look and becomes more narrow. 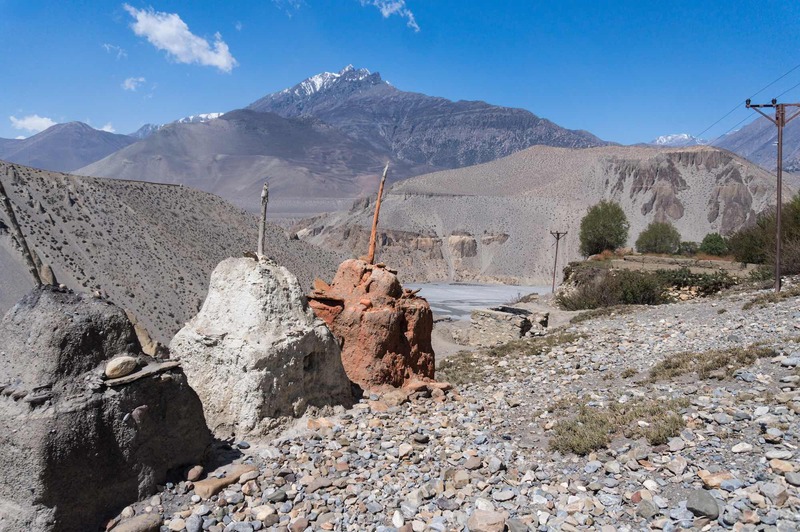 The road to Tsarang and Lo Manthang leaves the river at this point and climbs up to Chele and then over a series of a half-dozen passes and up, down, and across a few side valleys. 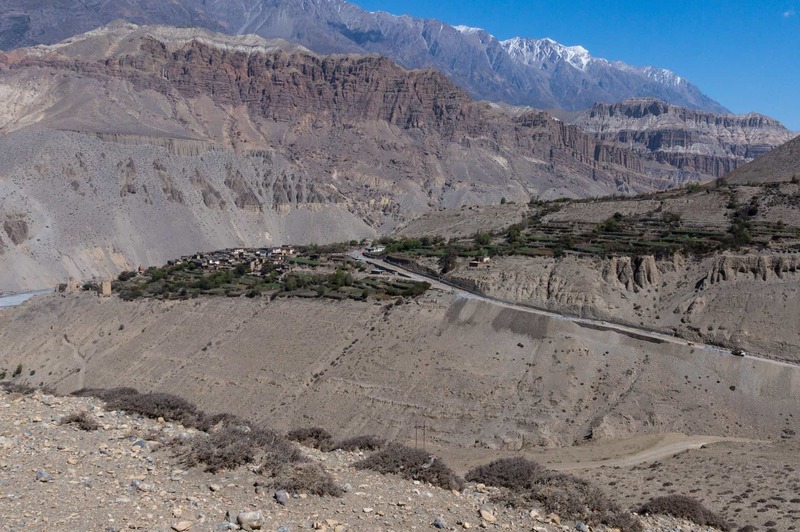 early afternoon on the road to Chele from Chhuksang – no shade! 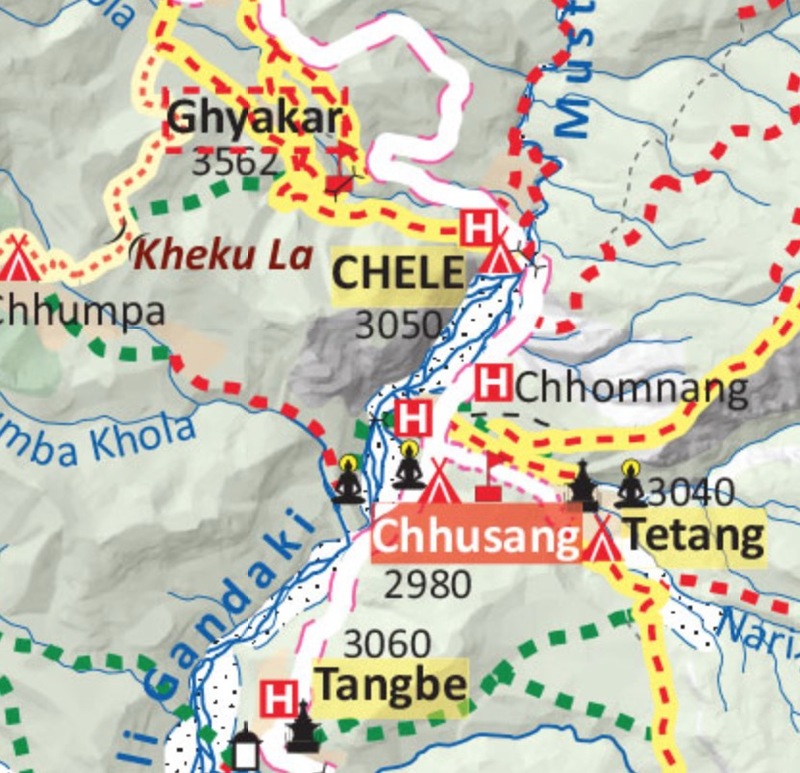 We got to Chele (also spelled Chaile, Tsaile, and Tsele on various maps) around 2:00. Given the complete lack of shade during most of the walk up the valley, getting out of the sun is not a bad idea! The wind also picks up as the day progresses so the more kilometers you can do in the morning, the better. While a few jeeps had passed us by during the day, we had yet to meet any other trekkers. They had left Kagbeni shortly after us on April 17. We would be seeing the occasional strip of orange trail marking tape the next couple of days as a reminder that they had too had been this way – just a bit faster than us! 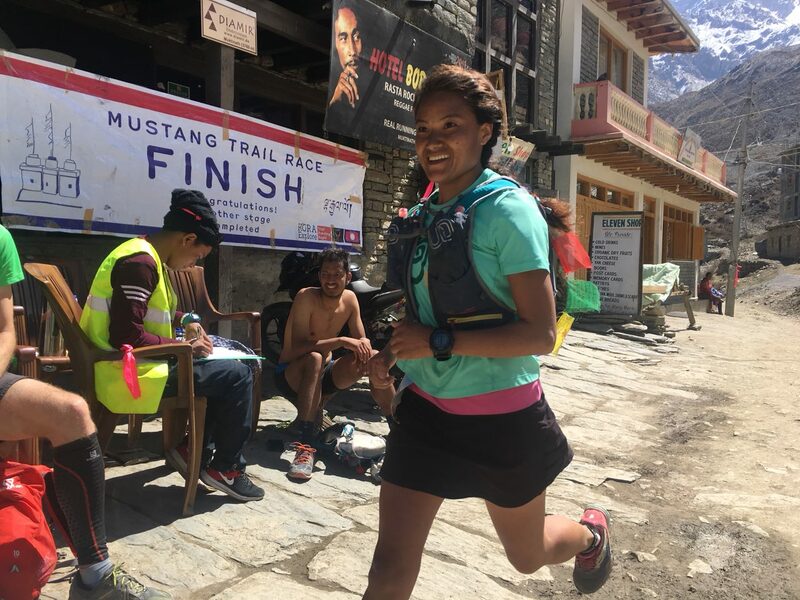 The fastest time was posted by Sherpa Chhechee, who completed the 166-kilometer route in just under 22 hours. 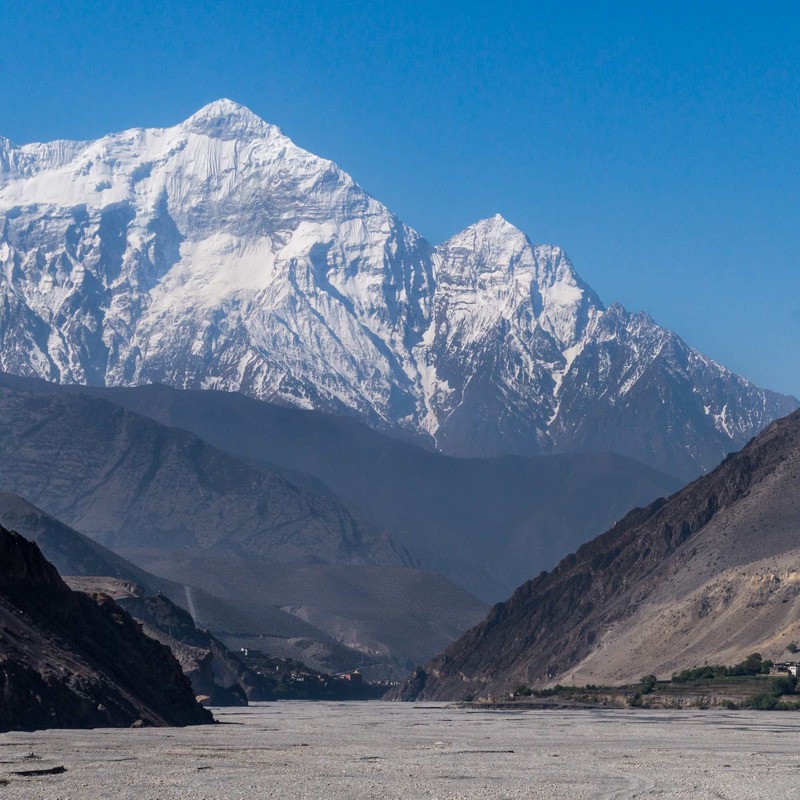 In the late afternoon, I walked back to the east side of Chele and from my rooftop vantage point got a nice shot of the river down to Chhuksang with the Annapurna peaks yet further to the south. 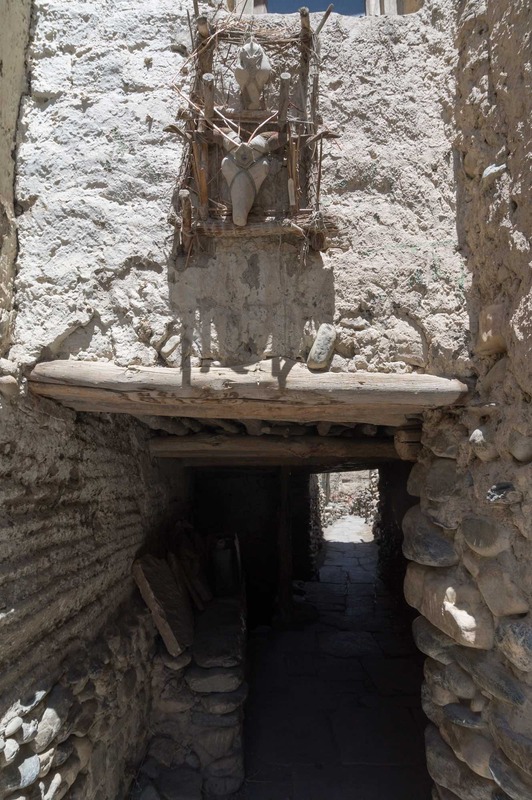 This entry was posted in hiking/trekking, Nepal and tagged Chele trek, Chhuksang trek, Gurung villages mustang, Hotel Mustang Chele, Kora La road, Mustang Trail Race, sky caves mustang, Tangbe Apple Farm, Tiri mustang, upper mustang roads. Bookmark the permalink.